Deathrattle: Give a random friendly minion +3 Health. The Cult of the Damned has found it's best not to mention their name when recruiting new cultists. I always think he's saying "My fate is seals!" when he attacks. Straight up most efficient 3-drop in the game with no drawback — hell, it even has an upside! It's up to you whether this or Kirin Tor Mage is better. As an avid Mage and Priest player, I strongly believe that the Dark Cultist is, by far, superior to Kirin Tor Mage. Though a 4/3 and a 3/4 may not seem very different, keep in mind that many 2-drops have 3 attack - this means that the Kirin Tor Mage will only take one hit before falling, and if a secret is not played, then you just lost a 3-drop to a 2-drop. On the Dark Cultist's side, however, because he has 4 health, this makes him a Spider Tank with a superb deathrattle - this means that he will most often trade 2-for-1 and still provide a bonus that is rarely situational - whereas, Kirin Tor Mage's deathrattle is almost always situational. Interesting Trivia- Has same quotes as Acolytes from WC3. I've run this into enemies for the +3 on a Lightspawn. example: I had Pint-Sized Summoner coined on T1. The Mage for some reason used Frostbolt on me. With the summoner out I was able to get this on turn 2 and a Lightspawn on turn 3. Mage played a Sen'jin Shieldmasta. I gladly traded the summoner and the cultist for it (in that order). With nothing blocking hit the light spawn was now a 8/8 and was buffed with a single Divine Spirit taking the Mage down enough they conceded. Make sure you plan where the buff goes if possible. 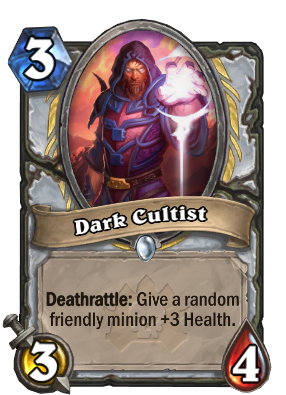 Many good priest and priest-like cards can use the +3 health. A few the come to mind are Lightwarden and (2h), [card]Northshire Cleric[/card] (3h). Taunts can also generally use more health. I don't think I'll ever build a priest deck without this card again. It's just ridiculously good. You had me at 3/4 for 3. That's gonna trade with almost everything on that mana or cheaper. The +3 health deathrattle is gravy to an otherwise already strong card. It fills the hole that is early plays of priests. With this I might not need to run stock neutral creatures because I need something to fill my curve. Innervate, Lightspawn and last but not least, DARK CULTIST!!! This is a very strong card. Not only is it a 3/4 so it will trade handsomely, but it also has a random Power Word: Shield built into it, and to top it off it's a COMMON card which means that we will be seeing a lot more of it in the arena as it will be an auto pick. This could make some of the only 3 drops with 4 attack better depending on how the arena changes. To everyone confused reading this, when the commenter wrote this, I believe Power Word: Shield provided 3 health to a minion and no card draw. omg, my Priest will have even more fun with this card! Without a doubt, the strongest minion of the Naxxramas cards. Followed by Undertaker, and Webspinner. A 3 mana 3/4 that gives off a random Temple Enforcer buff when it dies? Incredible value. Even if it gets silenced, it still has insane stats for a 3 drop. Turn 3 (turn 2 with a coin) place this on a field next to another minion and they will pay either buy burning cards to wipe all minions, or making the hard choice of keeping a 3/4 or giving other minion +3 health. The last thing you want is for priest minions having more health than you can one shot.